A trio of musicians based in Arlington (Texas), Herd of Instinct are one of the hottest new names on the vast progressive rock scene. The band was formed in 2007 by guitarist Mark Cook and drummer Jason Spradlin after the demise of their previous band, 99 Names of God, and started work on their self-titled debut immediately after the addtion of guitarist Mike Davison. The album, finally released in May 2011 on Djam Karet’s new label, Firepool Record, sees the collaboration of an impressive roster of guest musicians, including Djam Karet’s Gayle Ellett, German guitarist and composer Markus Reuter, and celebrated drummers Gavin Harrison, Jerry Marotta and Pat Mastelotto. The connection with Djam Karet, one of the few genuine cult bands on the whole progressive rock scene, undoubtedly creates expectations of intricate yet dynamic instrumental music – and this is exactly what Herd of Instinct offer in their debut (in spite of the presence of one track with vocals). Instrumental prog bands are often outstanding, and also tend to branch out far more than bands that prominently feature vocals. In a way, the instrumental dimension, fuelling the eclecticism that is an essential component of truly progressive music, allows musicians to explore avenues that sometimes are limited by the presence of a singer, and experiment with different aspects of sound (including pauses of silence) and the creation of a wide range of moods. Gloriously omnivorous and unabashedly bold, Herd of Instinct stake their claim on the territory where King Crimson held sway for 35 years. Even if Fripp has made a comeback of sorts in very recent times with the excellent A Scarcity of Miracles, Herd of Instinct’s debut brings back memories of state-of-the-art instrumental masterpieces such as “Larks’ Tongues in Aspic”, “Fracture” or “The Sheltering Sky”- a towering, multilayered achievement marrying flawless technical skill with a healthy dose of emotion, a feast of haunting soundscapes and jagged rhythms that seems to epitomize the very idea of progressiveness. Clocking in at about 48 minutes, Herd of Instinct features 10 relatively short tracks that are nevertheless packed with changes in tempo and mood, striking an admirable balance between edginess, melody and atmosphere “Transformation” introduces the album in brooding, highly cinematic fashion, with pounding drums and piano, ominously surging keyboard waves and tinkling bells. With the following track, “Room Without Shadows”, things take a decidedly heavier turn, the spacious orchestral effects already featured in the previous number blending with borderline metal riffing, and a stunning guitar solo that would not be out of place on an album like Starless and Bible Black. The gorgeously muted, Eastern-tinged opening to “Road to Asheville”, with its haunting flute, sitar and ethnic percussion, suddenly shifts into a crushingly heavy, riff-driven passage, ending on a mournful note with slow, acoustic guitar chords: while the aptly-titled “Hex” (the perfect soundtrack for some horror movie) opens with eerie electronic effects and then, slowly but inexorably, gains intensity, with crashing cymbals and spiky riffing opening in a marvellous guitar solo. “Anamnesis” is very much in a similar vein, a veritable feast for guitar lovers fuelled by spectacular drum work (courtesy of King Crimson’s very own Pat Mastelotto), with loops and other electronic effects depicting a richly emotional soundscape. “Blood Sky”, the only track featuring vocals, is one of the undisputed highlights of the album, a haunting showcase for the husky, understated vocals of former 99 Names of God singer Kris Swenson. Mellotron and marimba add subtle atmospheric layers to the spectacular guitar interplay, fleshed out by stunning percussion patterns.”Vibrissa” and “Possession” pursue a similar route, the former slow and measured, with interlocking guitar lines and soloing alternating between wildness and melody; the latter sparse and percussion-driven, with understated guitar work enhanced by snippets of wailing vocal samples. On “S. Karma”, the echoing, almost liquid sound of Mike Cook’s Warr guitar comes into its own, offset by an uncharacteristically aggressive flute solo that seems to mimic the heavy riffing. Closing track “The Face of Another” presents a basic power trio configuration assisted by electronics that provide a range of interesting effects as a background for Cook’s splendid guitar excursions – like a 21st-century take on King Crimson’s iconic “Discipline”. Herd of Instinct is one of those rare debut albums that are practically perfect in every respect, and need no suggestions for further improvement. An absolute must for fans of King Crimson, it will delight devotees of complex, hard-edged yet atmospheric prog, and those who are somewhat weary of technically competent bands that are sorely lacking in the originality department. 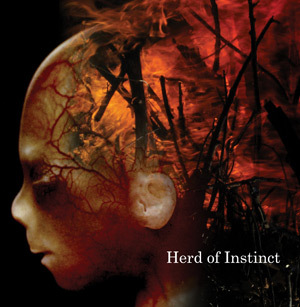 With outstanding (though slightly disturbing) cover artwork and photography, as well as excellent production by guest bassist/Warr guitarist Dave Streett, Herd of Instinct can be hailed as a serious contender for best release of 2011. Thanks for the positive review. It’s good to know that there are still great writers in Rock criticism. Cheers! Jason Spradlin…HERD OF INSTINCT. So I take it you liked this one then. 😉 So did I….it’s a great album! This is a great review as well. Or should I say your writing technique is well crafted and thought provoking as always……and if there was something you found to be critical of you would have given your analysis of it. But in a very respectful way…..this is what I like about your reviews. I feel guilty as I got this promo from Gayle right before I left to another country to renew my US student visa (am still stuck in that other country) and have yet to review the album (don’t have it with me here). What I remember from my 2 listens left a good impression on me. Once I get back to the US (once I receive my student’s visa), I’ll get to reviewing it. Great review, Raffaella (as usual) !